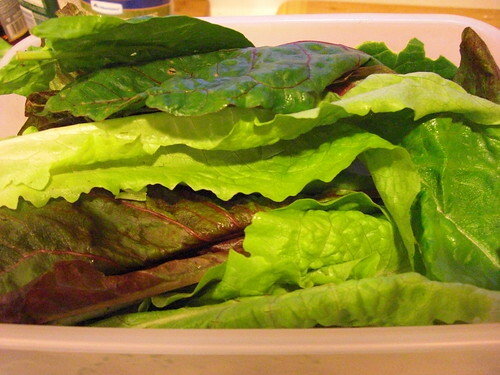 We were recently gifted with a large bag of fresh organic lettuce grown in our friends' greenhouse. I decided to skip salad, the obvious choice, and used the lettuce as my inspiration for some ground turkey wraps. I used Food Blog Search and found this recipe by Kalyn's brother Rand over at Kalyn's Kitchen. My cookbooks are so deprived and lonely these days because of Food Blog Search! In our house, whenever one of us feels at all unsure about something we're attempting in the kitchen, we call it an experiment. That way there's no pressure to get it right, and somehow that lessens the pressure! Luckily, our experiment failure rate is pretty low. This recipe was definitely considered an experiment since there were no quantities for ingredients, but I took that as an opportunity to play around a bit and really enjoyed it! I've been actively trying to teach myself about when ingredient quantities matter vs. when a recipe is more customizable. Because this dish turned out so well, I feel more confident in my ability to use my gut to guess the right proportions. The most surprising ingredient in these wraps was orange peel: it lent an nice flavor that I wouldn't have thought to add in myself. I'll definitely be making these again. I had almost all of the ingredients on hand already, but if you don't have something random like Thai fish sauce or dry sherry, you can improvise. 1. In a large bowl, combine cornstarch, low sodium soy sauce, water, dry sherry, salt and pepper. 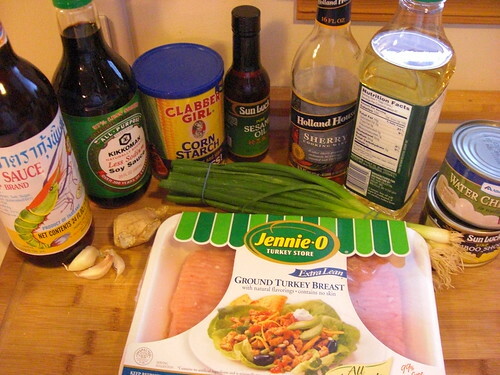 Add ground chicken or turkey and mix well. Let the mixture marinate in refrigerator for about an hour. 2. In a small bowl, combine low sodium soy sauce, dry sherry, water, hoisin sauce, thai fish sauce, rice vinegar, sesame oil, and a bit of orange zest. Mix well and set aside. 3. Heat a bit of peanut oil in a large skillet. Take the chicken or turkey out of the fridge and brown it in the oil, breaking up larger chunks as you saute. Remove from pan and set aside. 4. Add a bit more peanut oil to the pan and get it nice and hot. 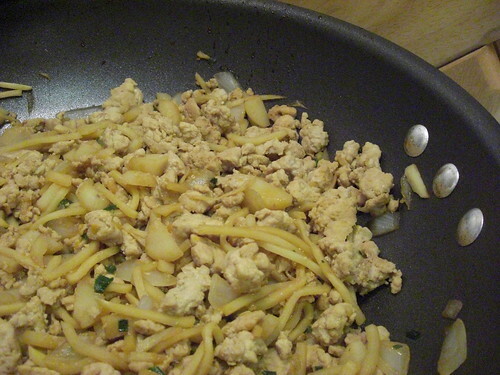 Add fresh ginger, minced garlic, green onions, sliced bamboo shoots, chopped water chestnuts, and any other veggie you like. I used some chopped white onion, and mushrooms or diced bell pepper would be yummy too. Saute until desired doneness, then return chicken to the pan and add the sauce. Mix everything together and simmer for a few minutes. Taste and adjust seasoning as desired. Serve with lettuce leaves and steamed rice (or whatever the heck you want). The original recipe included a dipping sauce, but I felt these were flavorful enough on their own. Enjoy!